Internet giant Google has today unveiled a new product called Google Stadia, which from later in 2019 will begin offering the ability to remote play video games using cloud-based streaming technology at up to 4K resolution in the USA, UK, Canada and much of Europe. But what sort of broadband ISP speeds will you need? I think this is the second indication we've had within a month of the direction online gaming is going. We had the announcement of Microsoft's new Xbox streaming box i.e. no disc drive so you have to download everything you need. Now we have this Stadia from Google which again is putting pressure on connection quality. Speed and low latency are going to be the buzz words for the next 5 to 10 years. Not really the same thing though. 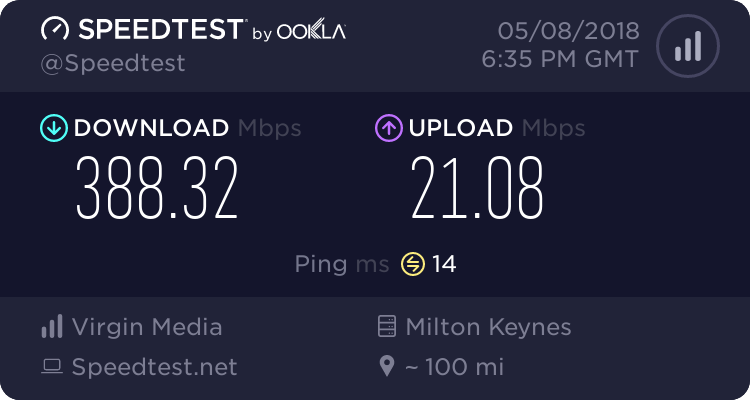 As games have huge day-one updates, while its a good idea to have decent broadband regardless if you are going physical or download only, its not essential. The biggest benefit for physical still is being able to sell it/buy used, especially for people on low incomes, the people who probably have the cheapest crappiest broadband so streaming is not going to be an option. I'm not convinced streaming will EVER be viable for the mass market. Its not like YouTube always works perfectly and that's not latency sensitive at all. I’ve drawn this comparison before, but broadband delivery is a bit like motorways. The more roads you build, the more people will use them, and nobody will get where they are going any faster. When I first started working from home, in software development, I had a 28kbps dial up. It wasn’t ideal, but it sufficed. It also sufficed for online purchases, hotel and airline bookings, etc. And it would still suffice today were it not for the lazy attitude of service providers, ready to assume huge bandwidth is available, and only too happy to use it all up the benefits of their own businesses. This is what bothers me about 5G being hailed as our saviour, while pushing it as "replace your business network with 5G". Cell density is going to do nothing if there isn't sufficient frequencies for dedicated bandwidth. Even then, going from a Gigabit or even 10Gig LAN to 5G seems like a terrible idea for a business, even before you consider the risks of trusting an outside network to protect your data. To me, streaming is a HUGE waste of bandwidth. Not to mention how much e-waste are these new gaming servers going to produce due to them being bespoke devices so presumably wont get sold-on once retired. At least with a console or PC, there will always be someone who is happy to use an old device, they can be sold-on multiple times and used until they die. Now don't get me wrong, I'm fascinated with the idea of a gaming system that can dynamically expand to multiple boxes so not being held back by the limit of a single GPU. But I honestly do not think its practical in the way they are marketing it nor is it good for the industry or the environment. I mean how much is it going to cost RENT two or three of these units to play one of these games that uses so many resources? Will I even be able to see the difference with all that compression on the image? It seems to me it makes more sense for games that are online only anyway, so there is zero latency between players and you are reliant on the data center in the first place for the entire experience. I've heard the google service is going to be free. But I agree with you guys, apart from the connection quality issue, there isn't even many good online games to play. We're going through a creativity drought in the triple aaa titles. It's going to need a next generation game in order to sell the idea. There is going to be a lot of people around the world that won't be able to access it due to line quality. Regarding 5G, I may be missing something. But is it not, in effect, a technology that is more comparable to Wireless Lan, rather than mobile telecomms? That would not be a bad thing if you live in a densely populated city with lots of base stations(/APs), and you are an early adopter. But for rural locations a dense networks of APs does not make sense, it is not economically viable. And even in cities, maybe they only make sense as long as uptake is low. I reason that as uptake increases, there must come a point where demand cannot be satisfied just by installing more APs, as mutual interference would render the technology ineffective? Streaming games is not restricted to online games. I've tried Geforce Now on my Sheild TV which is hardwired and it has issues even on my 380/20 connection.